The Riverton Unit is located in central Wyoming in Fremont County on the ceded portion of the Wind River Indian Reservation. The unit lands lie in the Wind River Basin and to the north of the river. Direct flow water from Wind River and stored water from Bull Lake and Pilot Butte Reservoir are used to provide irrigation service to approximately 73,000 acres. Unit features are Bull Lake Dam, Pilot Butte Dam, Wind River Diversion Dam, and Pilot Butte Power plant, together with approximately 100 miles of main canals, 300 miles of laterals, and 335 miles of drains. The unit receives its water supply from the Wind River and its tributaries. The principal storage is provided by Bull Lake Reservoir on Bull Lake Creek. Supplemental storage is provided by Pilot Butte Reservoir, an off stream reservoir supplied with water diverted from the Wind River via the Wind River Diversion Dam. Water released from Bull Lake Reservoir flows through Bull Lake Creek to the Wind River where it augments the natural flow of the stream. Water for unit lands is delivered through the Wyoming Canal, which leads from the Wind River Diversion Dam to the Pilot Butte Reservoir and beyond to the distribution system. Pilot Canal flows in a generally easterly direction from Pilot Butte Reservoir, servicing lands lying south of those supplied by the Wyoming Canal. Pilot Butte Reservoir is located 10 miles below the Wind River Diversion Dam. Three earthen filled embankments that constitute Pilot Butte Dam form the reservoir. The main embankment is 51 feet high and has a volume of 135,000 cubic yards. To complete the reservoir, two other embankments were required, one 25 feet high containing 51,000 cubic yards of material, and the other 12 feet high containing 19,000 cubic yards of material. The reservoir has an active capacity of 31,600 acre-feet. Located 34 miles northwest of Riverton, Wyoming, Wind River Diversion Dam is a concrete weir with earth dikes, and has a hydraulic height of 19 feet and a volume of 124,000 cubic yards. The spillway is a concrete ogee weir with a capacity of 40,000 cubic feet per second. 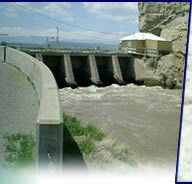 The outlet works to Wyoming Canal has a design capacity of 2,200 cubic feet per second. Pilot Butte Power plant is located at the drop from the Wyoming Canal to Pilot Butte Reservoir. The plant has two generating units, which operate under a maximum head of 105 feet each with a total capacity of 1,600 kilowatts. Power is distributed over 76 miles of transmission lines. There are two main canals in the unit. The Wyoming Canal is 62.4 miles long and has a design capacity of 2,200 cubic feet per second; the Pilot Canal is 38.2 miles long with a design capacity of 1,000 cubic feet per second. About 66 percent of the total length of these two canals is lined. The lateral system totals 300 miles, 104 miles lined and 19 miles of pipeline. The drainage system extends 335 miles, of which 141 miles are closed pipelines.